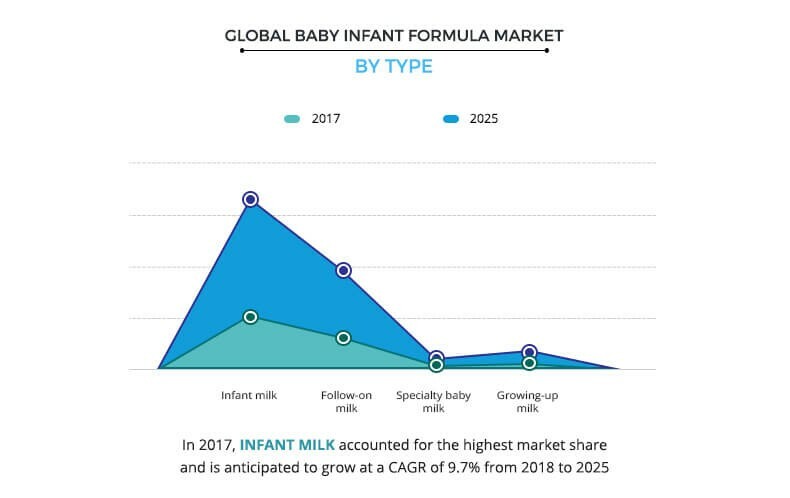 The global baby infant formula market size is estimated to be $24,043 million in 2018, and is projected to reach $45,348 million by 2025, registering a CAGR of 9.5% from 2018 to 2025. Infant formula consists of various nutrients, such as carbohydrates, fats, proteins, vitamins, minerals, and others (linoleic acid, prebiotic, and others), that are fed to babies for their overall development. Although physicians recommend exclusive breastfeeding for under six months babies, infant formula can be used as an alternative, as it consists of similar nutrient contents. Increase in women working population outside home is the key factor that drives the market. Moreover, change in lifestyle, rise in middle class population, growth in disposable income in emerging economies such as India, China, Indonesia, and increase in awareness about high nutritional content in the infant formula propels the market growth. However, concerns related to food safety and decline in global birth rate may hamper this growth. 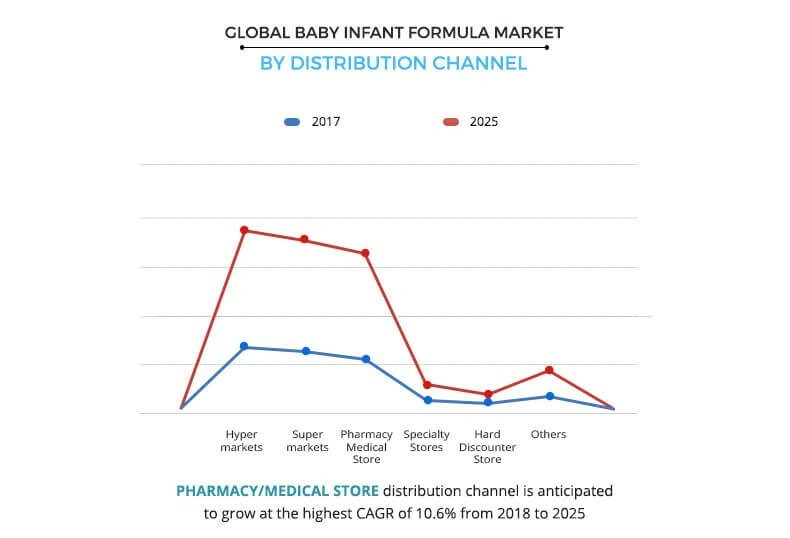 The leading players in the Baby infant formula market have focused on product launch, as their key strategies to gain a significant share in the market. The key players profiled in the report include Abbott, Arla Foods Amba, Campbell Soups, Dana Dairy Group Ltd, Danone, D-Signstore, HiPP GmbH & Co. Vertrieb KG, Reckitt Benckiser (Mead Johnson & Company LLC), Nestle S.A. and The Hain Celestial Group. Asia-Pacific is expected to be the highest revenue contributor to the global market, owing to presence of large population under the between 0 and 4 years. 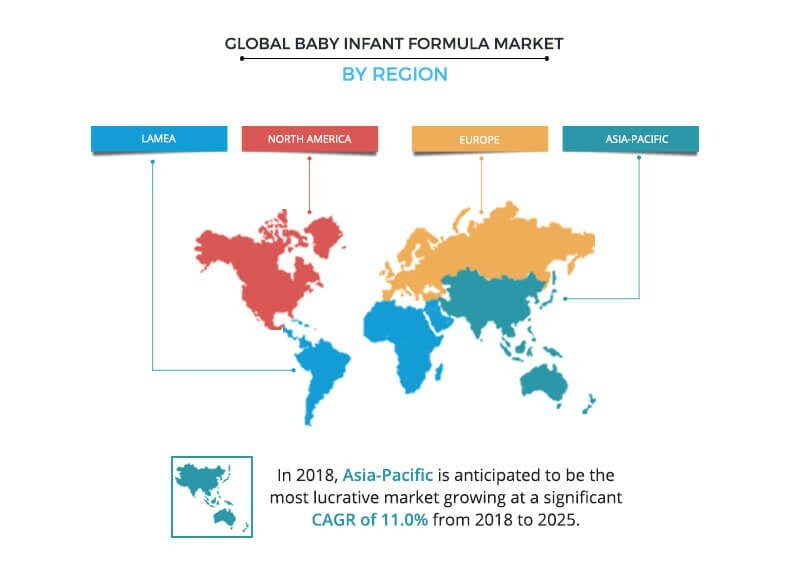 Growth in female participation in labor force, increased disposable income, busy lifestyle, and high standards of living in countries such as China, India, Indonesia, Philippines, and South Korea boost the baby infant formula market growth. China is anticipated to dominate the baby infant formula market, in terms of both revenue and volume, accounting for more two-thirds of the share in Asia-Pacific region in 2018. Brazil is the largest contributor in the LAMEA baby infant formula market, owing to the presence of high disposable income among the consumers and of large number of working women in Brazil. As per World Bank, 42.9% of women occupy the total labor force in Brazil. On the other hand, Saudi Arabia is anticipated to the second fastest growing country in LAMEA region, due to high birth rate and high disposable income of the consumers. In 2017, infant milk is estimated to account for the highest market share owing to rise in physician’s recommendation to use infant milk as a substitute to breastfeeding, as it is healthy and nutritious choice along with better convenience. Iron-rich infant milk helps prevent anemia. Various infant milks are supplemented with probiotics, which help to prevent diarrhea, ease colic, and lower the risk of food allergies. In 2018, hypermarkets distribution channel is anticipated to generate the highest revenue and would maintain its dominance during the forecast period. Whereas, pharmacy/medical store is expected to grow at the highest CAGR of 10.6% from 2018 to 2025. 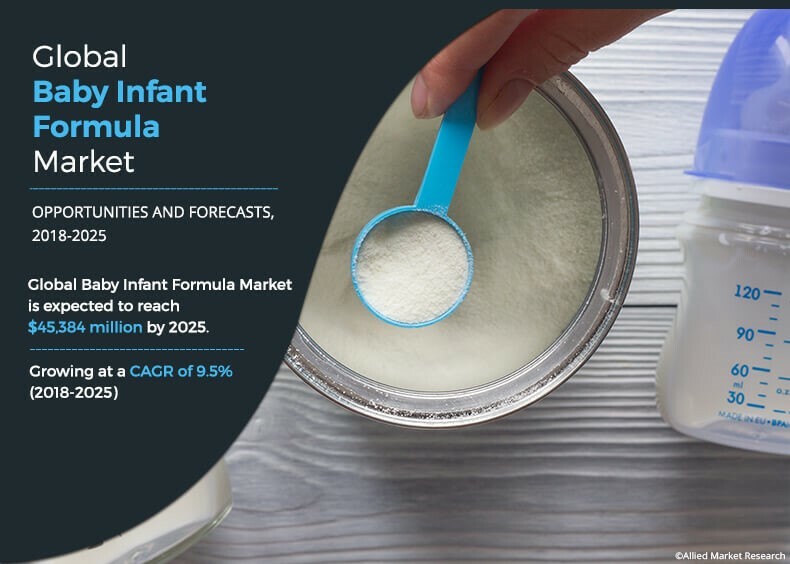 The report provides an in-depth analysis of the current trends, drivers, and dynamics of the global baby infant formula market to elucidate the prevailing opportunities and tap the investment pockets. It offers qualitative trends and quantitative analysis of the global market for the period of 2018&dash;2025 to assist stakeholders to understand the market scenario. In-depth analysis of the key segments demonstrates the types of baby infant formula available. 8.4. Dana Dairy Group Ltd.
Baby infant formula comprises products with increased levels of energy, protein, and certain vitamins and minerals necessary for proper development of baby. Physicians recommend infant formula milk and follow-on-milk to babies under 12 months as a substitute to breastmilk, while specialty baby milk and growing-up milk are recommended to baby more than 12 months for their overall development. Infant formula simulates breastmilk and is considered suitable as its complete or partial substitute. Active launch activities and promotion of baby infant formula in the U.S. and UK have led to higher adoption of infant formula the western region. Moreover, growth in number of women working outside home in developing countries such as China, India, Indonesia, Philippines, Brazil, and Saudi Arabia boosts the market growth. China accounts for the largest share in baby infant formula market, owing to withdrawal of one child policy by the Chinese government. Large number of population aged 0–4 years, especially in India, China, and Indonesia, is expected to continue to drive the market growth. Convenience for working mothers to feed the baby, change in lifestyle, and increase in disposable income are various other factors that have led to increased consumption of baby infant formula. Moreover, increase in health-conscious parents seeking for minimally processed and natural food for their babies accelerates the demand for infant formula free from ingredients such as added sugar, sodium, and preservatives, which may create new opportunities for the manufacturers.